WHY CHOOSE AIMERDAY YOGA MAT? 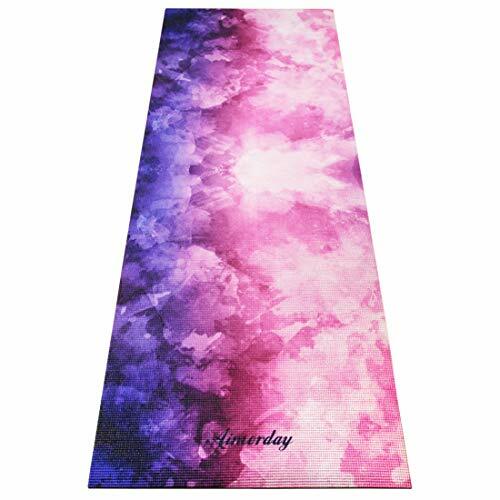 If you are looking for a comfortable, durable and great looking mat, Aimerday yoga mat is a great choice for you! We have designed them with CARE & LOVE to offer you the most amazing yoga mat ! Whether you are just a beginner or a seasoned yogi, Aimerday yoga mat will try to take your practice to the next level! With double sided non-slip surfaces, grip the floor firmly and keep your hands and feet sticky with the mat all the time. Combines with exquisite printed pattern and phthalate free printing oil, Aimerday yoga mat is not only beautiful but also healthy. 72in(183cm) x 24in(62cm) x 0.25in(6mm), this extra long, extra wide, extra thick mat can fit your need for various exercises. Weighs 4 lbs(1.8kg) and comes completely with a carrying case and strap, make it easy to follow you anywhere. -It's not recommended to use this yoga mat when wearing shoes. Washable-Bath tub filled with cold water, put added detergent, washing powder the less the better,then scrub with a damp cloth and rinse the mat. At last, with dry towel roll up yoga mats, blot excess water. Dry shade, avoid direct sunlight. 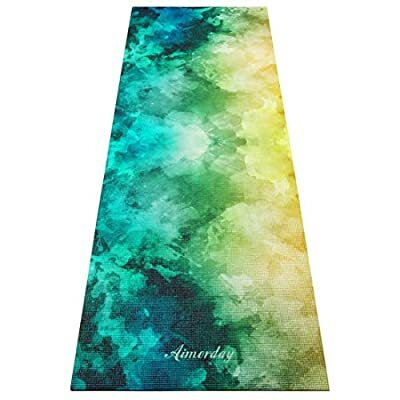 Aimerday yoga mat is the best fitness gift for your friends and youself! Come and join us! 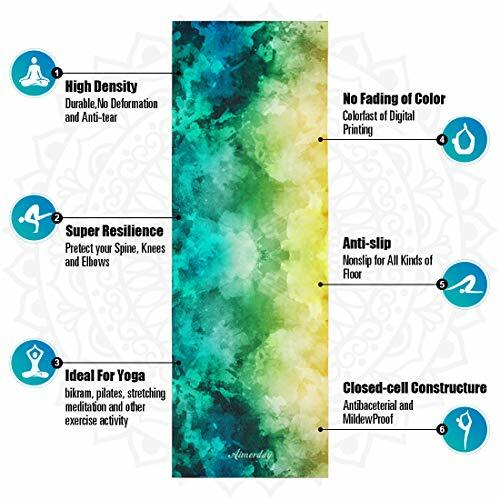 NON-TOXIC & COMFORTABLE : Aimerday yoga mat is safe use for men and women, children and adults. 100% eco printing oil which is free from silicone, latex, toxic glue, phthalates & chlorine. The waterproof surface with closed-cell construction prevents the moisture, dust and germs from being absorbed into the mat. Just clean the mat with wet cloth after using. ANTI-SLIP & ANTI-TEAR : Durable and high density pvc material which is not easily deformed or get scratched. The double-sided anti-skid surface and great friction can hold the ground better to protect your spine, hips, arms, legs, knees and elbows. The creative triple-layer design that adds anti-tear grids to the middle layer which can make the mat long-life-used. IDEAL SIZE & PORTABLE: 72x24 inch long ensures enough space for most exercises like hot yoga, pilates, ashtanga, bikram, vinyasa and balance exercises.5mm thickness in helping cushion joints and avoid slipping and injury. Each Aimerday yoga mat comes complete with a high quality convenient shoulder carry strap & bag for keeping the mat neatly rolled up to storage. It's lightweight (2 lbs)and easy to carry to your yoga studio or fitness club. BEAUTIFUL & EXCLUSIVE DESIGN: Designed by Independent Designer from Aimerday with advanced printing technology made mats colorful and never worry about fading. 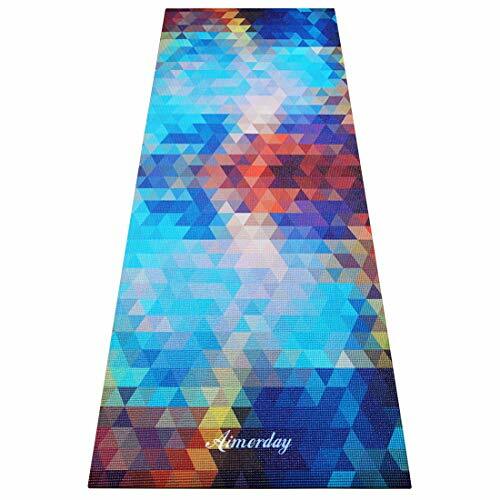 Aimerday splendid exclusive designed pattern yoga mat helps you light up your practices. 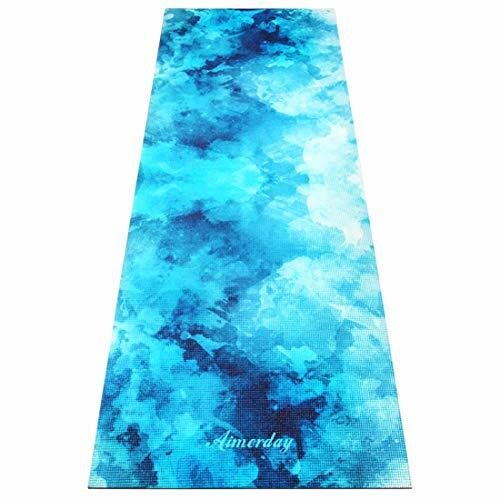 You will never worry about getting compliments from others as soon as owning Aimerday Yoga Mat, when you are doing exercise in the gym, yoga studio or in the travel! 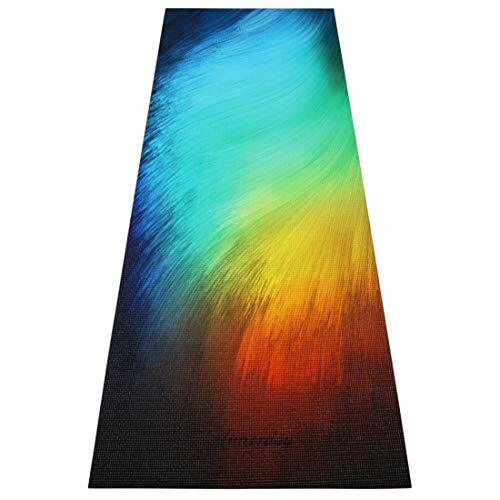 PREFECT GIFT & 5 STARS CUSTOMER SERVICE: Aimerday yoga mat is the most delicate gift for you friends, families and yourself. And within 90 days you bought our item, we accept your return for full money refund. Completely Risk-Free! Our goal is 100% satisftion of after-sale service. ORDER NOW-TIME LIMITED DISCOUNT, you will get a unique Aimerday Yoga Mat with a free strap and carrying bag for home, Gym and travel!l!